There are plenty of establishment Republicans who need to worry about primary challenges from the Tea Party next year but George Allen doesn't appear to be one of them. 67% of Virginia GOP voters say Allen's their top choice to be their Senate candidate next year, compared to only 7% who prefer Bob Marshall, 4% for Jamie Radtke, 3% for David McCormick, and 3% for Corey Stewart. Those results could be explained to a large extent by Allen's superior name recognition though. What's more telling is that only 25% of Republicans prefer a generic 'more conservative' challenge to Allen, while 52% stick with the former Senator. That's better than most long time GOP politicians are faring against hypothetical foes to the right- before he retired we found Jon Kyl under 50% against a 'more conservative' alternative and Bob Corker actually trails a generic challenger to his right. So for Allen to have a 27 point lead on that measure is significant. It's not surprising though given how popular Allen is with Virginia Republicans and how comfortable they are with him ideologically. 68% of primary voters have a favorable opinion of him to only 15% with with an unfavorable one. More significant in the context of a possible Tea Party challenge is that 69% of Republicans think he's 'about right' ideologically to only 9% who think he's too liberal and actually an equal 9% who think he's too conservative. There's just not a very strong sense within the GOP base that Allen's too far left. Radtke's name recognition with Republican primary voters is only 21% so there's some potential for her to gain ground as she becomes better known and the same could be said of Bob Marshall, who currently has only 25% name id, if he decided to get in. But all things considered the specter of a primary challenge to Allen just doesn't look that serious. As he does throughout most of the South, Mike Huckabee leads the way for President in the state with 20%. Mitt Romney and Sarah Palin tie for second at 16% with Newt Gingrich rounding out the top tier of potential candidates at 14%. Ron Paul leads the second tier with 8%, followed by Mitch Daniels at 7%, and Haley Barbour and Tim Pawlenty at 4%. This is one of the best performances we've found for Daniels anywhere we've polled, perhaps an indication that the Beltway obsession with him is spilling over a little bit to GOP primary voters in northern Virginia. Holding Romney back from a stronger position in Virginia is a fourth place finish with voters describing themselves as 'very conservative,' with whom he registers at just 12%. He's a solid second to Huckabee with the other two major GOP ideology groupings of 'somewhat conservative' and 'moderate' voters. 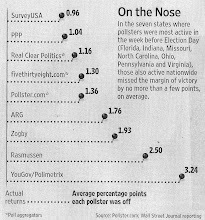 Gingrich is actually by a small margin in first place among those furthest right Republicans. I like the very/somewhat breakdown on the ideology question. That would be good to include in future polls. It will be asked like that in future polls. We've noticed it's made more former moderates admit they're at least somewhat liberal. Glad to see Mike Huckabee is holding strong and even climbing in numbers and has never announced. Mike says in the summer, he will announce. One political scientist has said his timing is perfect with his book of a more simplistic approach to government because the people are ready for it. And it will be perfect timing to announce in the summer! I believe America is holding firm on their determination for a candidate of high character in 2012 like Huckabee ! Glad Huckabee is polling well. Hopefully he can keep up the momentum into 2012. He's a dynamic conservative that I would love to see in the White House.